Time to move on to the defense. If you haven't seen the offense yet, here are the links for quarterback, running back, wide receiver, offensive line, and tight end. With the question marks surrounding the ND offensive line, I know I was interested to see who they would line up against. As always, the number in parenthesis is where Phil Steele ranked a player at that position. He only ranked NFL Draft eligible players, so no freshman or sophomores are listed. For the stat lines, TFL=tackles for loss, FF=fumbles forced, and FR=fumbles recovered. DE - Kevin Basped. RS Junior. Returning Starter. 2008 stats: 50 tackles, 10.0 sacks, 18.5 TFL, 3 FF. DT - Nate Agaiava. RS Senior. Returning Starter. 2008 stats: 10 tackles, 1.5 TFL, 1 FR. DT - Zach Madonick. Sophomore. New Starter. 2008 stats: 3 tackles, 1.0 sack, 1.0 TFL. DE - Dontay Moch. RS Junior. Returning Starter. 2008 stats: 50 tackles, 11.5 sacks, 17.5 TFL, 4 FF. The strength of the Wolfpack line clearly lies in their defensive ends. Redshirt juniors Kevin Basped (right) and Dontay Moch might be the second best DE tandem that ND will face all season long. Definitely they were one of the most productive last season, with both ends finishing in the Top 20 in the nation in both sacks and tackles for loss. It is worth noting however that against unranked teams the duo picked up 20.5 sacks while in their 3 games against ranked teams they were held to only 1.5 sacks. The interior of the Nevada line is slightly undersized with Nate Agaiava and new starter sophomore Zach Madonick both checking in at 285 pounds. They have the speed to plug running holes quickly and Agaiava has proven he's stout against the run, but will be at a 30-50 pound disadvantage when going against ND's interior OL. Depth: Senior Chris Slack was beaten out at the end of fall camp by Madonick for the new tackle spot. He will probably rotate in with the largely untested sophomore. DE - Brandon Graham. (#7) Senior. Returning Starter. 2008 stats: 69 tackles, 3.0 sacks, 7.0 TFL, 2 FR, 1 FF. NT - Mike Martin. Sophomore. New Starter. 2008 stats: 20 tackles, 2.0 sacks, 4.5 TFL. DT - Ryan Van Bergen. (#50 DE) RS Sophomore. New Starter. Playing more of a 3-4 defense, Michigan will place two new starters alongside one of the best players on the team with overall DL depth being a big concern. Brandon Graham (left), the team's MVP from last season, is back at defensive end and will be one of the best that ND faces. Stout against the run and pass, Graham will be double-teamed all season long. The new man in the middle is sophomore Mike Martin. He had an impressive debut as a true freshmen last year and is poised for three years of starter duties. At 6'2" 285 pounds, he's lighter than most nose tackles, but is extremely fast and strong for his size. Redshirt sophomore Ryan Van Bergen is perhaps the biggest question mark on the line. He did start one game last year and play in 12, but only picked up 13 tackles in that time. At 6'6" 270 he's more of a run stopping DE than pass rusher. Depth: Michigan is hurting is depth on the defensive line. The backup nose tackle is junior Renaldo Sagesse, but he only picked up 3 tackles last season in 9 games and is even lighter than Martin at 279 pounds. Adding size is freshman star recruit Will Campbell at 6'5" 318 pounds. He'll probably play against ND this season, but will be more of a pain in future seasons. The backups at end are rarely used redshirt junior Greg Banks and redshirt sophomore walk-on Will Heniger. DE - Trevor Anderson. RS Senior. Returning Starter. 2008 stats: 30 tackles, 8.0 sacks, 10.0 TFL, 1 FF. DT - Oren Wilson. Junior. Returning Starter. 2008 stats: 15 tackles, 0.0 sacks, 1.5 TFL. DT - Kevin Pickleman. RS Sophomore. New Starter. DE - Colin Neely. RS Junior. New Starter. The Spartans have to replace two starters, but are probably in better overall shape than last season with much greater depth. It's also a faster line than in years past, favoring athleticism over bulk in the starting lineup. Redshirt senior Trevor Anderson (right) is the big name of the line after an All-Big Ten honorable mention 2008 season. Nose tackle Oren Wilson had double digit starts last season and is the biggest starter on the line at 6"3" 294 pounds. Bouncing back from a leg injury, redshirt junior Kevin Pickelman grabbed a hold of a starting tackle spot despite only checking in at 263 pounds. Likewise for redshirt junior Colin Neely at end. At 6'1" 248 he's not a terribly big defensive end, giving a hint that the Spartans are looking for a faster line. Depth: Pushing Neely is sophomore David Rolf who was an instant contributor on special teams as a freshman. Listed at 6'4" 228 pounds, the converted linebacker is definitely going to be a pass-rusher first, run-stopper second. A strong spring has 292 pound redshirt freshman Jerel Worthy listed with the first string at tackle, but he fell behind Pickelman in the fall. Still, he should see plenty of action. And the depth just continues with 6'7" 260 pound end Tyler Hoover, and the massive 6'5" 338 pound Antonio Jeremiah. DE -Ryan Kerrigan. Junior. Returning Starter. 2008 stats: 56 tackles, 7.0 sacks, 11.5 TFL, 2 FF. DT - Mike Neal. RS Senior. Returning Starter. 2008 stats: 33 tackles, 5.5 sacks, 10.0 TFL. DT - Kawann Short. RS Freshman. New Starter. DE -Gerald Gooden. RS Sophomore. New Starter. 2008 stats: 14 tackles, 2.0 sacks, 4.0 TFL. End Ryan Kerrigan (left) was All-Big Ten honorable mention last season and is one of the better players on the Purdue roster. Listed at 6'4" 263 pounds he's not a undersized pass rusher but still tallied 7 sacks last season. Redshirt senior 300 pound Mike Neal is a tough veteran who also had an impressive 5.5 sacks from his defensive tackle. Two new starters who still are in fall camp battles to hold on to their starting spots. Redshirt sophomore Gerald Gooden is built like a pass rushing specialist at 6'3" 235 pounds. Although he played in 12 games last season and started two, he only picked up 14 tackles. Redshirt freshman Kawann Short will be making his collegiate debut this season and should be a tough obstacle to move at 310 pounds. Depth: Pushing Short up until the end of fall camp was redshirt sophomore Nick Mondek who at 6'5" 283 pounds is a more experienced but less bulky option than Short. Right behind Golden is redshirt sophomore Nickcaro Golding. A linebacker/end mix at 6'5" 225 pounds, Nickcaro did start one game last year, but will be coming off the bench, perhaps in 3rd and long situations, in 2009. DE - Daniel Te'o-Nesheim. (#25) RS Senior. Returning Starter. 2008 stats: 65 tackles, 8.0 sacks, 11.5 TFL. 1 FF. DT - Alameda Ta'amu. Sophomore. New Starter. DT - Cameron Elisara. Junior. New Starter. DE -Darrion Jones. RS Senior. Returning Starter. 2008 stats: 17 tackles, 1.5 TFL. The star of the Husky line is redshirt senior Daniel Te'o-Nesheim (right). One of the better ends in the Pac-10, Te'o-Nesheim will once again be the focus of opposing offensive lines. Lining up next to him will be one of the biggest defensive tackles that Notre Dame will face in 6'3" 348 pound sophomore Alameda Ta'amu. Starting five games as a freshman last season, Ta'amu should be much improved now that he had an off-season to better learn the position. Being nearly 350 pounds helps too. Junior Cameron Elisara is listed as a new starter, but he did start seven games last season, including the first four. At 275 pounds, he's the quicker tackle next to the massive Ta'amu. Darrion Jones started nine games last season, but wasn't terribly productive with only 17 tackles. Depth: One of the more promising young players is sophomore defensive end Everette Thompson. Slowed by ankle injuries in the off-season, he started three games as a freshman last year and the 6'6" 262 pound end is a speedy pass rusher with a bright future. DE - Everson Griffen. (#5) Junior. New Starter. NT - Christian Tupou. Junior. Returning Starter. 2008 stats: 12 tackles, 3.0 TFL. DT - Jurrell Casey. Sophomore. New Starter. 2008 stats: 12 tackles, 2.0 TFL, 1 FF. DE - Armond Armstead. Sophomore. New Starter. 2008 stats: 10 tackles, 1.0 sacks, 3.0 TFL. While most attention is on their new linebackers, Southern Cal is going to break in three new starters along the defensive line. Junior Everson Griffen (left) was supposed to crack the starting lineup last season, but lost his starting job to Clay Matthews. Now back in the starting lineup, the former star recruit could have the breakout year many expect. At 280 pounds, Griffen is fast and one of the bigger ends ND will face in 2009. SC's nose tackle Christian Tupou is the lone returning starter from last year. He cracked the starting lineup in the third game and the 295 pound tackle will again add quickness to the SC line. Next to him new starting tackle Jurrell Casey who beat out talented upperclassmen to earn a starting job. Last year's SC Scout Team Defensive Player of the Year, Casey could be a pain for the next few seasons. Sophomore Armond Armstead is currently injured, but should be back in time for the Notre Dame game. If he's 100% back, he will be a load off the edge as ND won't face a bigger defensive end than the 6'5" 295 pound Armstead. Depth: If Armstead isn't back, the postion gets a lot younger with two redshirt freshmen, Nick Perry and Wes Horton, fighting sophomore Malik Johnson for playing time. The other end position is similarly young with true freshman 5-star recruit Devon Kennard backing up Griffen. In the middle, the Trojans got an influx of size in 6'2" 330 pound JUCO transfer Hebron Fangupo. He's not as quick as the starters, but when they need to bulk up against the run, look for Fangupo to anchor the middle. Redshirt senior Averell Spicer (#48) can't keep a hold on the starting tackle job, but should play frequently in a rotation with Jurrel Casey. DE -Jim Ramella. RS Senior. Returning Starter. 2008 stats: 35 tackles, 4.0 sacks, 9.0 TFL, 1 FR, 2 FF. DT - Damik Scafe. RS Junior. New Starter. 2008 stats: 13 tackles, 1.0 TFL, 1 FR. DT -Austin Giles. (#49 DE) RS Senior. Returning Starter. DE - Alex Albright. (#30) RS Junior. Returning Starter. The big news for the Eagle line is the need to replace last year's huge tackles B.J. Raji and Ron Brace. The replacements so far are redshirt junior Damik Scafe and redshirt senior Austin Giles. Neither are as big as the Raji/Brace duo, so the 295 pound Scafe and 278 pound Giles, who started at defensive end last season, will have big shoes to fill. Scafe has two years of backup playing time to his credit so he's not completely untested. The vet on the line is returning starter Jim Ramella (right) at defensive end. The redshirt senior has started 17 games in his career and will be one of the leaders of the BC defense. Opposite him will be redshirt junior Alex Albright. An All-ACC honorable mention selection in 2007, Albright was lost for nearly all of 2008 with a neck injury. Now that Albright is back, Giles will slide back to the inside. Depth: Sophomore Kaleb Ramsey was pushing for one of the two open defensive tackle spots, but for now will have to wait behind Giles. DE - Kevin Kooyman. Senior. New Starter. 2008 stats: 31 tackles, 1.0 sacks, 4.0 TFL. DT - Toby Turpin. RS Junior. New Starter. 2008 stats: 20 tackles, 3.0 sacks, 3.5 TFL. DT - Bernard Wolfgramm. RS Junior. New Starter. DE -Travis Long. Freshman. New Starter. Washington State is effectively looking to replace the entire defensive line depth chart from the one that finished last in the nation in rush defense last season. Senior Kevin Kooyman (left) did start 6 games last year while fighting through some ankle injuries so he is the most experienced returning player. Of the 9 other players on the DL depth chart, redshirt junior and starting tackle Toby Turpin is the only other player who saw any game action last season. The 284 pound junior started four games for the Cougs. Redshirt junior Bernard Wolfgramm sat out last year after transferring in from a junior college in 2007. He has potential to be a solid tackle at 288 pounds, but a back injury limited him in the spring and could affect his 2009 season. 6'4" 247 pound true freshman Travis Long was one of the surprises of fall camp, beating out the rest of the competition to earn a starting spot at end. Depth: Redshirt senior Jesse Feagin is also a JUCO transfer who sat out last season. He played in 10 of 12 games in 2007, but sat out last year. Listed around 266 pounds, he's a DE built to stop the run rather than rush the passer. 6'3" 239 pound Casey Hamlett, a transfer from Western Washington, is pushing for playing time and will probably replace Kooyman on passing downs. Redshirt junior Josh Luaop is a JUCO transfer who is new to the team and adds some heft to the depth chart at 321 pounds. The other tackle backups is 260 pound redshirt freshmen Dan Spitz. Backup end Adam Coeper is also a redshirt freshmen looking for his first collegiate snap. DE - Jabaree Tuani. Sophomore. Returning Starter. 2008 stats: 42 tackles, 1.5 sacks, 9.0 TFL, 1 FR, 3 FF. NT - Jordan Stephens. Senior. New Starter. 2008 stats: 3 tackles, 0.5 sacks, 0.5 TFL. DE -Matt Nechak. Senior. Returning Starter. 2008 stats: 39 tackles, 4.o sacks, 8.5 TFL, 1 FR. Navy's defense took a big hit when 6'3" 292 pound nose guard Nate Frazier was kicked off the team. With 26 straight starts he was one of the best players on the team and a vital cog in Navy's 3-4 defense. The tall task of replacing him falls to senior Jordan Stephens. Stephens has played in 20 games over his career, but at 6'4" 256 pounds will take a pounding as the centerpiece of Navy's 3-4 defense. The situation at end is better with returning starter Matt Nechak and the very promising Jabaree Tuani (right) starting. Nechak did miss the spring due to a knee injury, but started 12 games last season and has plenty of experience. Tuani is the rare Navy freshman who cracked the starting lineup in his first season. A 6'1" 265 pound end, Tuani won't give up size to anyone and has the potential to be one of the best Navy defensive linemen in a long time. Depth: Junior Chase Burge is listed as a co-starter at nose guard along with Stephens. Slightly bigger than Stephens at 270 pounds, the duo will likely rotate frequently to stay fresh. Senior Michael Walsh is back after a toe injury forced him to miss most of last season and all of spring practice. With 17 career starts under his belt, he will be a tough and dependable veteran to split time with the promising Tuani assuming he is fully back from his injury. DE - Greg Romeus. (#15) RS Junior. Returning Starter. 2008 stats: 51 tackles, 7.5 sacks, 15.5 TFL, 1 FR, 1 FF. NT - Gus Mustakas. RS Senior. Returning Starter. 2008 stats: 14 tackles, 1.0 sacks, 2.0 TFL, 1 FR. DT - Mick Williams. RS Senior. Returning Starter. DE - Jabaal Sheaard. Junior. Returning Starter. 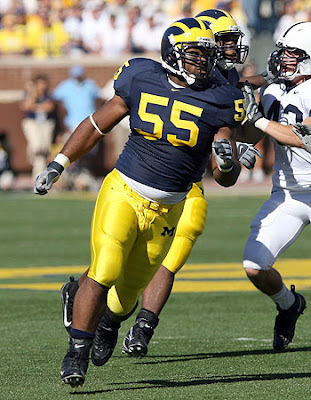 2008 stats: 45 tackles, 5.5 sacks, 10.5 TFL, 1 FR, 1 FF. In 2009, Pitt will field one of the best defensive end tandems in the nation. The star is redshirt junior Greg Romeus (left). The 6'6" 270 pound end is big enough to hold up against the run, but as his 15.5 tackles for loss show, can get into the backfield in a hurry. He could be the best DE that ND faces in 2009. His tag-team partner is junior Jabaal Sheard. The 260 pounder was similary effective at making tackles behind the line of scrimmage. Both Romeus and Sheard started every game last season. Defensive tackle Mick Williams has started 16 games over the past two seasons while missing a few games due to injury. His 8.5 tackles for loss are an impressive total for a tackle and are evidence that the 280 pounder can do damage in the backfield coming from the interior of the line. Nose tackle Gus Mustakas is techincally a returning starter with 17 career starts, but 12 of those came in 2006. An ACL injury took away his 2007 season and has slowed him down since then. The 6'3" 285 pound Mustakas will likely be part of a rotation, but at the very least has the experience to be an effective tackle on such a veteran line. Depth: Redshirt sophomore Myles Caragein is the backup to Mustakas and will see time after playing in 12 games last year as a reserve. Former star recruit Shanyle Hale sat out his freshman year last season and will operate in 2009 as Greg Romeus's backup and likely heir apparent. DE - Lindsey Witten. Senior. New Starter. 2008 stats: 19 tackles, 5.0 sacks, 6.0 TFL, 1 FR. DT -Twyon Martin. RS Sophomore. Returning Starter. DT - Kendall Reyes. RS Sophomore. New Starter. 2008 stats: 20 tackles, 1.5 sacks, 3.0 TFL, 1 FF. DE - Jesse Joseph. Freshman. New Starter. Marcus Campbell ruled ineligible.The Huskies will need to rebuild the line after losing three starters from last year's defensive line. Defensive end Lindsey Witten (right) has played in nearly every game since he came to campus, but so far has only started two. He still picked up 5 sacks last season and could improve on that number in '09 if the rest of the line is able to keep offenses from focusing on him. Marcus Campbell was expected to be the star of the defensive line at end, but he was kicked off the team in the off-season. In his place will be true freshman Jesse Joseph. The 6'3" 238 pound end enrolled early so he has the benefit of spring practice, but will still face an uphill battle fighting against collegiate upperclassmen all season long. The lone returning starter is redshirt sophomore Tywon Martin. The 271 pound tackle took over the starting job over the final 8 games of the season in 2008 and should be even more comfortable now that he's a returning vet. His classmate Kendall Reyes picked up four starts last year while playing in a rotation as a 286 pound tackle backup. Depth: There isn't too much depth on the DL with another freshman in Trevardo Williams backing up the freshman Joseph. The biggest lineman on the team, 6'3" 292 pound redshirt senior Brandon Dillon will back up Martin in the middle. DE - Erik Lorig. RS Senior. Returning Starter. 2008 stats: 39 tackles, 3.0 sacks, 6.0 TFL, 3 FR, 1 FF. DT - Ekom Udofia. (#10) RS Senior. Returning Starter. 2008 stats: 30 tackles, 2.0 TFL. DT - Matt Masifilo. RS Sophomore. New Starter. 2008 stats: 22 tackles, 0.5 TFL. DE -Thomas Keiser. RS Sophomore. New Starter. The graybeard for the Cardinal DL is redshirt senior Erik Lorig. With 20 career starts, Lorig has been a mainstay the past few seasons. Up at 270 pounds, Lorig is equally capable defending the run or rushing the passer. Classmate Ekom Udofia (left) has been around forever as well. His 24 career starts give him plenty of experience and another veteran presence on the line. At 315 pounds, he provides a big presence. Redshirt sophomore Matt Masifilo played valuable minutes as a backup last season and even cracked the starting lineup for four games. He's the quicker 285 pound tackle to Udofia's run-stuffer. Last season was redshirt sophomore Thomas Keiser's first college action and he made the most of it. His lone start was against ND and he played well enough the rest of the year to be named to multiple freshman All-America teams. Like Lorig, Keiser is a big end at 6'5" 257 pounds and sounds like a player with plenty of potential. Depth: Senior Brian Bulcke has started at least one game each of his three years on campus, giving him 9 total career starts. Coming off the bench, he'll give Stanford even more depth and experience at defensive tackle. 305 pound junior Sione Fua is back from his LDS mission and will be another big body Stanford can use in the middle of the DL. Redshirt senior Tom McAndrew has only started one game in a career that has seen him play linebacker, tight end, and defensive end, but he has plenty of experience as a reserve and will make a deep Stanford DL even deeper. The play of Notre Dame's offense line will be under the microscope all season long, especially when it comes to run blocking. That's why one of the things that struck me while writing this post was the size, or lack thereof, of the defensive lines that will face ND in this rapidly approaching 2009 season. Last season, there was a laundry list of talented and experienced defensive tackles that tipped the scales at over 300 pounds: SC's Fili Moala, Michigan's Terrance Taylor, BC's Raji and Brace, UNC's Marvin Austin and Cam Thomas, Purdue's Alex Magee, and Stanford's Ekom Udofia. All of the graduated players from that list were all picked in the first 4 rounds of the NFL Draft this past spring. That size and pro potential certainly showed against Notre Dame as 290 pound center Dan Wenger had trouble throughout the year holding his ground against the bull rushes from the larger and more powerful tackles. This year is a study in contrast as only three starters out of the 24 opposing defensive tackles are listed over 300 pounds: Stanford's Udofia, Purdue Kawann Short, and Washington's Alameda Ta'amu. Udofia is the only one of the lot who isn't a new starter. Put another way, there were 9 defensive tackles ranked by Phil Steele on last year's list. This year there is only 1: Udofia. ND meanwhile made a switch at center and will start the 305 pound Eric Olsen. What will it mean? Well, any excuse about size is completely out the window as ND enjoys a healthy size advantage along the interior of the line, especially when you add in 330 pound Chris Stewart. If there is ever a year to pound the ball and try to wear undersized defensive lines down, this is it. On the flip side, lighter tackles mean quicker tackles. Robinson, Olsen, and Stewart will really need to play as a well-rehearsed unit to stop the faster tackles from penetrating double teams and slicing into the backfield for tackles, ala ND's line from a few years ago of Derek Landri and Trevor Laws. Where there is some potential concern is at the defensive end spot. Go down the list and notice that the best player on nearly every team is the returning starter at defensive end. Only SC, UConn, and WSU lack a veteran starter at end, and SC's Griffen is perhaps the most physically talented end that ND will face. In other words, Paul Duncan and Sam Young have their work cut out for them this season. It's good that ND has such veteran players out on the edges to handle these ends, but I wonder what the impact will be on ND's passing game. To be honest, it's all the more reason to run the ball early and often so that the ends can't just pin their ears back and take off after Clausen as soon as the ball is kicked off. Still, there are some solid run-stopping ends on the list as well, so I am interested to see how effective the stretch play and screen game are. It will also be paramount that the blocking from ND's tight ends is a big improvement over last season. A stronger Rudolph and healthy Ragone don't worry me too much, but they still need to show it on the field. The stout blocking Bobby Burger might be a more important player this season than the causal fan might think. Let's take a look at the rankings. I think Pitt is a clear #1. The next three are probably clustered together on the second tier. Then BC through Purdue, possibily Navy, are probably pretty close to one another. The bottom rung of UConn and Washington State could struggle most of the season against the run. 1. Pitt - A tough, veteran line with an excellent pair of defensive ends. 2. Stanford - No flashy all-stars, but an experienced, big, and deep collection of players. 3. Southern Cal - A world of potential, but still plenty of new starters to break in. 4. Michigan - Some real talent in Graham and Martin, but not much depth. 5. 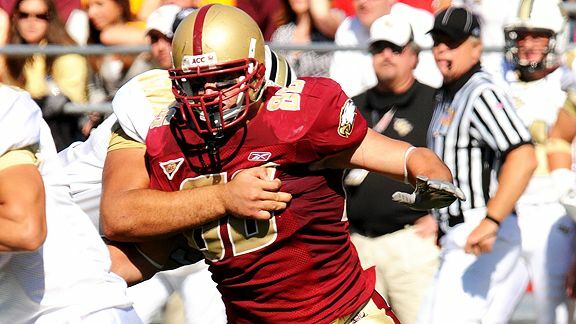 Boston College - Veterans ends, but the replacements in the middle are question marks. 6. Nevada - Speedy ends, but could be overpowered by bigger opponents. 7. Michigan State - A decent collection of depth that could be underrated at this spot. 8. Purdue - Kerrigan and Neal are a solid combo, the other side of the line will need to produce. 9. Navy - Quality on the edges, but losing Frazier in the middle hurts. 10. Washington - Still a bit of a one man show with Te'o-Nesheim. 11. UConn - When you have to start a true freshman on the DL, talent and/or depth is a concern. 12. Washington State - See UConn. Add in nation's worst rush defense from last year.